I didn’t set out to have this for Thanksgiving, in fact I didn’t know it was Thanksgiving until mid-morning. Wednesday was hanging in my mind that morning. But in fact I had thawed duck breasts because having found a place where I could buy other than a whole duck, albeit frozen, I was eager to see if it was really good. Serendipity. But I am well into THE DIET and most of my many ways with duck won’t go there, no matter how hard I press and not even with a hammer. For about a month it’s been protein and non-starchy vegetables and that looks to be the prevision until well into summer of 2011. I am learning to subsist mostly on the cabbage family. Steam the cabbage with a bit of salt until it is par-cooked. Drain and leave in the pan. Rub the salt/seasoning mix onto the duck breasts, distributing it well, and bring them to room temperature. Put a heavy frying pan on medium heat and immediately lay the duck breasts in it, skin side down. This is one of those few times you start with a cold pan, like with bacon. The skin will start to exude a bit of fat, which is what you want to see. The breasts I used were not really fatty, as are the ones I usually bone out of a whole, fresh duck. They were smaller, too, which is a good thing, I think. When there is a fairly generous amount of fat in the pan, add the onion slivers. 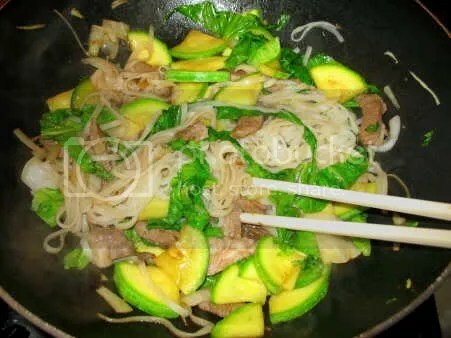 Continue to cook, stirring about sometimes, until the skin is nicely golden brown and has lost most of its fat. Turn the breasts. Continue to cook until the internal temperature of the breasts is about 125°F, then turn them one more time and let the skin re-crisp. It won’t be very very crispy, but pleasantly so. Remove the breasts to a cutting board to rest 10 minutes or so. Immediately toss the cabbage into the pan with the onions, stirring about. It will pick up the fond, or brown bits, in the pan. Add the battuta of olives and stir about. When everything is well-heated, check for seasoning and correct. 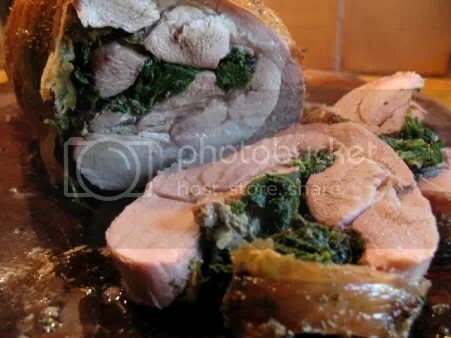 Use a sharp knife to carve the duck breasts into thinnish medallions. It should be pink-rare all the way through, no cool blueish center as with beef, but just rosy all the way. 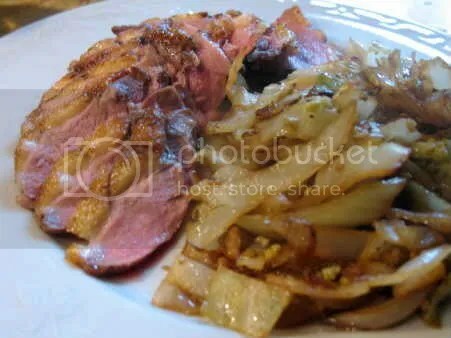 Arrange the duck and half the cabbage on each plate and enjoy every bite. I certainly did! Over a year ago I discovered chermoula when I prepared a Moroccan supper for friends. That was the best lamb I had ever made and I swore I’d always make it that way. But when Easter came this year I wanted the meal to be more Italian rather than Moroccan, so I undertook to make the chermoula taste like Italy. There’s something about holidays that makes me want to be traditional. 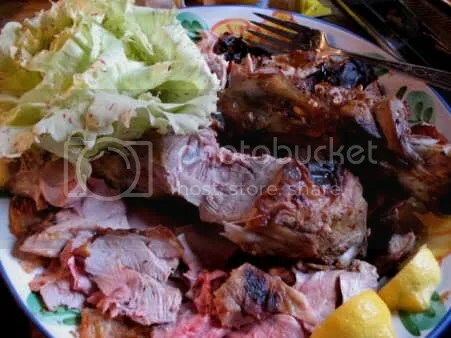 Is it traditional to eat lamb in Italy? Decidedly, yes, it is. There are lots of recipes, mostly very cooked, some even simmered rather than roasted, and I am willing to try out all of them. 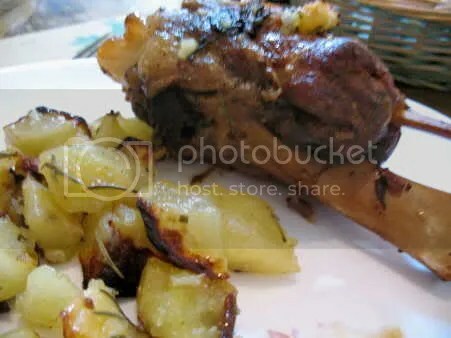 For Easter I wanted a pair of roasted legs, however and I wanted them succulent, a bit rare and subtly perfumed with the herbs and spices of Italy. Here’s what I came up with. 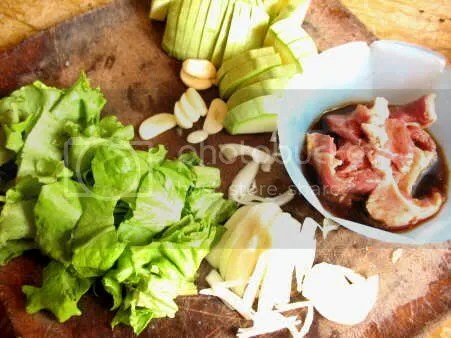 This is a single recipe and will marinate 1 kilo or 2.2 pounds of meat. Mix those all together. I used the food processor to smush up all of it. In a glass or ceramic dish or a large Ziplock bag, put the lamb and then the marinade. Use your hands to distribute the paste all over the meat. Seal and marinate the meat for at least a day and two days is even better. Take the meat out an hour before you plan to cook it and let it come to room temperature. Remove most of the marinade with your hands. Put the meat in a shallow dish and roast to the doneness you like or barbecue it if that’s possible. You may simmer the marinade in a little pan and serve it as a sauce with the meat at table. Nothing I can say to you will help you with how long it will take to cook this meat. Our legs of lamb are so tiny you could mistake them for a turkey thigh. Yours will be much bigger unless you too live in Italy. I really liked this, but I like the North African version even better. On the other hand, all od these ingredients are readily available and the ingredients for traditional chermoula are not. EG came up with this recipe, which is as simple as most good things are, and shared it with us. She thinks that if she’d had a grill pan and grilled the scallions first it would have been even better. Probably the final cooking could be done that way, too. It seems the most important thing is not overcooking these very thin, very lean steaks. That means pre-cooking the scallions a bit, then cooking the rolled up steaks very quickly on high heat. Oil and salt the scallions and cook them briefly over moderate heat to soften them. Roll them in the steaks and cook over high heat just to brown. Salt and pepper to taste. If you feel Italian, drizzle them with a tiny thread of olive oil and serve them with a wedge of lemon. Eg’s photos are always affected by the light bouncing off her chartreuse kitchen walls, and I have not yet convinced her that she should take her food onto the balcony for photography.